65 records – page 1 of 2. Photograph is an aerial view looking south over the Chinese Market Gardens along Marine Drive. 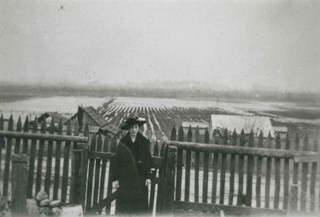 Photograph shows various Chinese-Canadian market gardens in the Big Bend area. Planning map of district lots 163, 162, 157, 158, and 165, near the Chinese Market Gardens along Marine Drive. Planning map of district lots 163, 162, 157, 158, and 165, which is primarily the area farmed by Chinese and Chinese-Canadian market gardeners around Marine Drive between Royal Oak and Mandeville (present-day Nelson). Two Chinese/Chinese Canadian land owners can be seen on the map: N.G. Wah Sing (or Ng Wah Sing) and Yee Law (or Herbert Law). Title based on contents of map. Herbert Yee Law was donor's father and this map may have originally been his copy of the city planning/engineering documents. Photograph of the exterior of the Bolton house on Marine Drive. 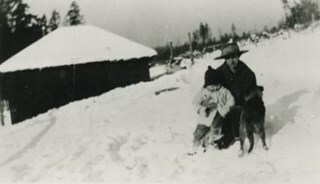 Photograph of Lou Haymoulde (child), Nancy Bolton, and a dog in the snow. The photograph was taken near Marine Drive. 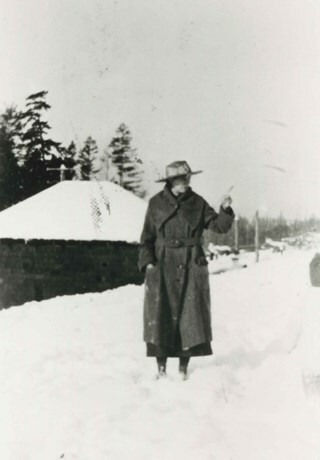 Photograph of Nancy Bolton standing in the snow near Marine Drive. 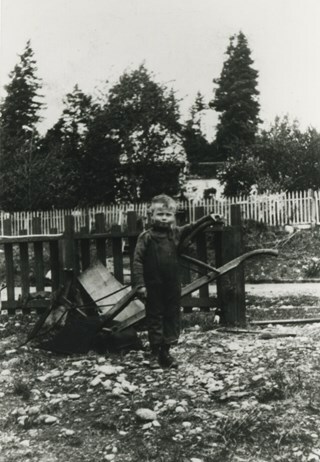 Photograph of a boy standing at a white picket fence holding onto a wheelbarrow alongside Marine Drive. The Unident house can be seen in the background. Photograph of a man driving a boy along Marine Drive in a small "trap", or light-weight, two-wheeled horse-drawn carriage. 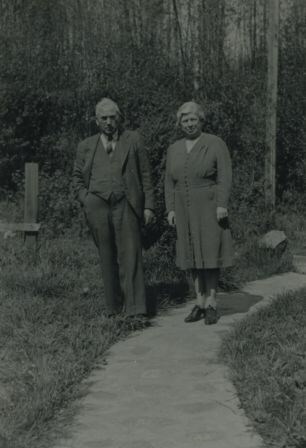 Photograph of Dr. Wesley Morris and his wife, Laura Maude Weegar Morris standing beside a pathway at Marine Drive. 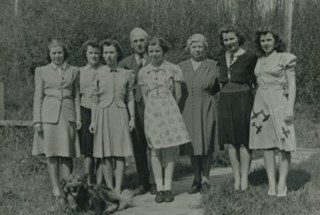 Photograph of the Morris family; Second eldest Laura Elizabeth (Betty), third eldest Dorothy Rhoda Adelaide, eldest Margaret Janet, and father Dr. Morris, along with youngest Muriel, mother Laura Maude Weegar Morris, third youngest Jessie Ellen, and second youngest Gertrude Kathleen standing beside a pathway at Marine Drive. Their dog Nemo is lying at Laura Elizabeth's feet. (Nemo was part police dog). 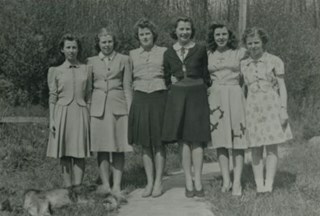 Photograph of the Morris daughters standing on a pathway at Marine Drive, in a row from eldest to youngest: Margaret Janet (eldest), Laura Elizabeth (Betty), Dorothy Rhoda Adelaide, Jessie Ellen, Gertrude Kathleen, to Mureil (youngest). Their dog Nemo is lying at their feet. 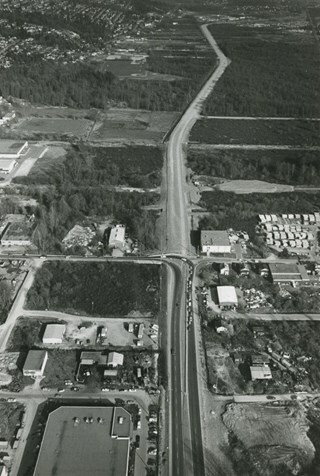 Aerial photograph of the Marine Drive bypass into Burnaby. 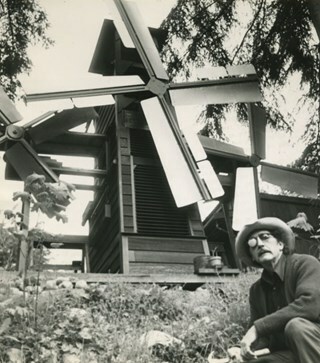 Photograph of professional musician John Hudson crouched in front of the windmill that he built next to his home on Marine Drive. 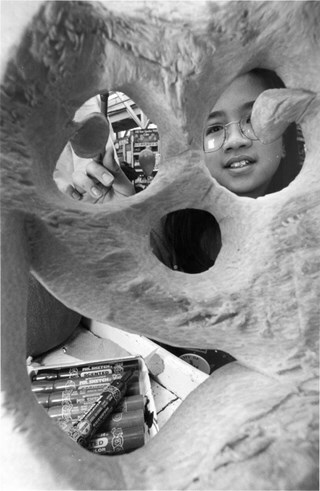 Photograph of Elayne Wong carving a pumpkin at Mandeville Garden Centre, on Marine Drive in South Burnaby. 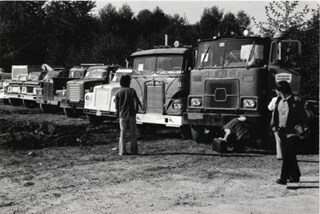 Note in black and blue ink on recto of photograph reads: "Bby Brian 2989 C / 97% Bby p.1"
Photograph shows men inspecting trucks up for auction at a vacant lot on Marine Drive. 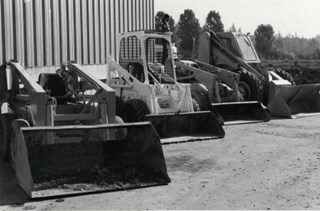 Photograph shows earthmoving machinery up for auction at a vacant lot on Marine Drive. 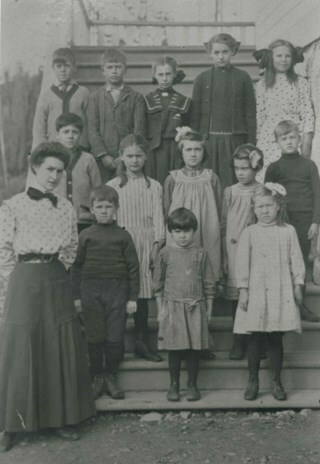 Photograph of students of Riverway East School located in South Burnaby. The children, aged about 7 to 10, are outside in front of the school building. A note in the accession file identify the students as follows: Back row (l to r): Ed Palanski, unidentified boy wearing a tie, Carla Smith, Hillman, Patricia Murphy, Pegg Gould, Hilda Murphy, unidentified girl, Pearl Young, Cyril Harcourt, Ed Parslow, and Frank Harcourt; Middle row (l to r): Pauline Whitaker, Nora Lackalau, Ellen Peterson, May Wong, unidentified girl, Dorothy Parslow, Gladys Yates, Sybil Yates, Phyllis Lloyd, unidentified girl, Evelyn Smith, and an unidentified girl; Front row (l to r): Barnard Clissold, Ronald T. Lerriault, Kennedy (last name unknown), Ted Towson, Arthur Yalis, unidentified boy, Sydney Harcourt, unidentified boy, and Jack Towson. An annotation on the back of the photograph reads: "Riverway East 1922." Photograph of a class of eleven girls and two boys standing outside with their teacher Miss Annie Forrest at the Dundonald School. 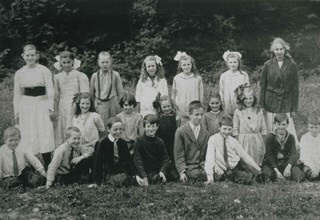 The students pictured in the photograph are; Maggie Byrne, Annie Thrussell, Nellie Woollard, Gussie Woollard, Elwood Bent and Tommy Brawnlie, Blanche Woollard, [first name unknown] Brawnlie, Ethel Thrussell, Norah Byrne, Mary Byrne, Bessie Woollard and Alice Woollard. 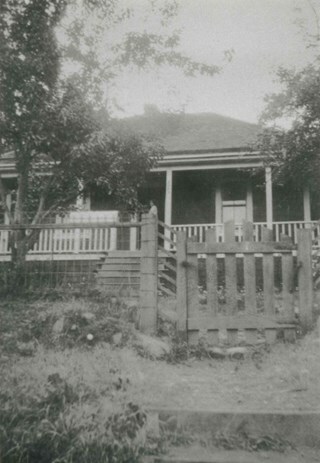 Later called Fraser Arm School, Dundonald School was the fourth school built in Burnaby. Note on verso of photograph reads: "Dundonald School. 1906 Left to Right. Maggie Byrne, Annie Thrussell, Nellie Wollard, Gussie Woollard, Elwood Bent, Tommy Brawnlie, Blanche Woollard, Brawnlie, Ethel Thrussell, Nora Byrne, Mary Byrne Bessie Woollard, Alice Woollard." 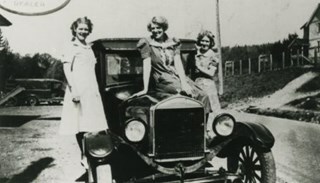 Note in pencil on recto of photograph reads: "1906"
Photograph of three women posing on a Model T Ford on Marine Drive at Gilley Avenue. 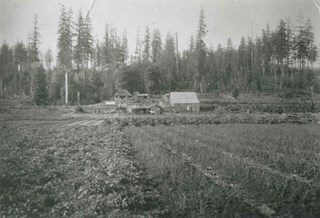 Photograph of the Marine Drive Game Farm, founded and owned by William "Bill" Greenslade's father, William Greenslade, Sr. 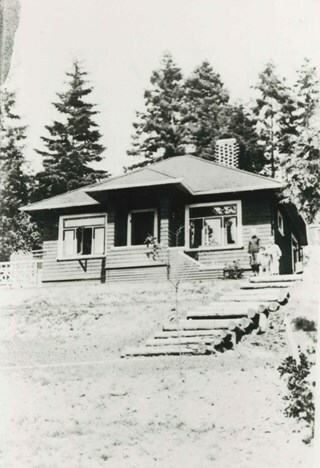 It was located at 3295 Marine Drive (later renumbered 5421 Marine Drive). 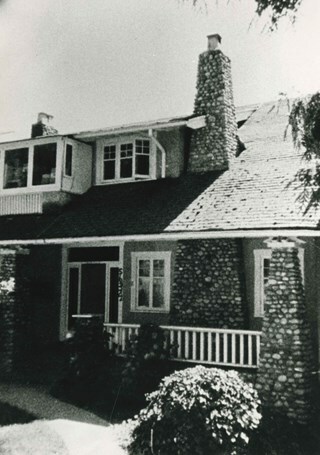 Photograph of masonry work done by John Pickard, on the Timms house at 5634 Marine Drive . 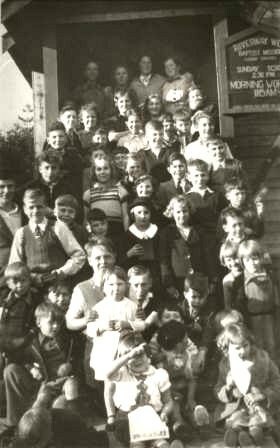 Photograph of a large group standing on the steps at the front entrance to the Riverway West Baptist Mission. A sign on the right advertises Sunday School and the times for morning worship. Photograph of two women and a young girl standing in the snow outside, in front of the Riverway Mission. 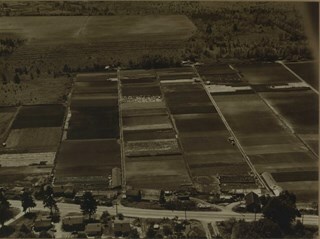 Photograph of the North Arm Dairy and the rest of the Thrussell family farm at Marine Drive and Nelson Avenue. Froggers Creek is visible on the left. 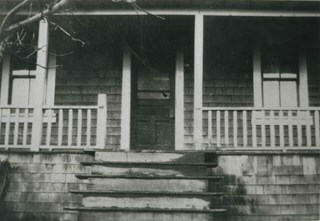 Photograph of the front steps of the Thrussell house on Marine Drive. Photograph of the North Arm Dairy, the Thrussell farm and family business. Half a dozen cows are walking towards the barn as the children mingle around them. 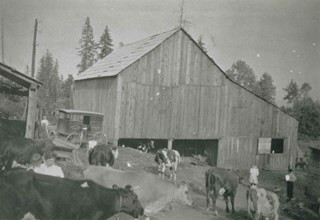 The large barn is in the center, and the North Arm Dairy wagon is visible in the background. Photograph of the North Arm Dairy, the Thrussell farm and family business. The family is standing in front of the garage that houses the North Arm Diary wagon. The younger Frederick is standing with his arm across his brow, blocking the sun. His two sisters Ethel and Mary Anne are beside him. Eva is standing beside her mother Harriett, who has baby Edith in her arms. The elder Frederick is standing front and center. Another man stands off to the right. In the distance, half a dozen cows are walking towards the barn. Photograph of the North Arm Dairy, the Thrussell farm and family business. 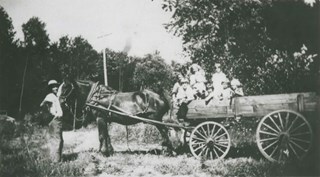 A young child is sitting on one of the horses that is harnessed to the dairy wagon. The other horse has no rider, but a girl is holding on to the riens and sitting in the dairy wagon. A man is standing beside the horse with the rider, holding his reins. 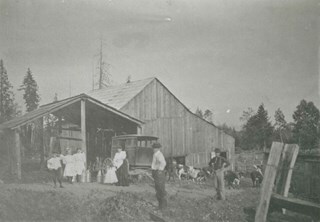 Two cows are standing in front of the barn, along with a woman who is holding a child in her arms. Photograph of Ethel Thrussell, one of Frederick and Harriett Fenwick Thrussell's children, at the gate of the Thrussell family home. 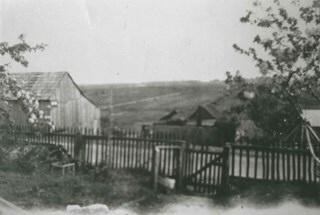 Photograph of the Thrussell family farm, including the front gate and barn on Marine Drive, at Nelson Avenue. 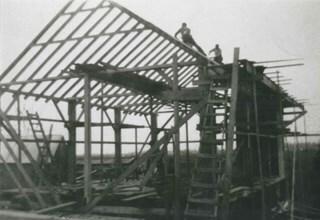 Photograph of the construction of the new barn at the Thrussell farm. 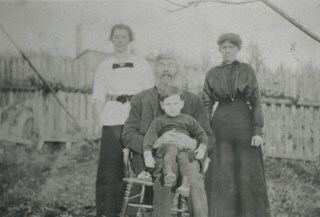 Photograph of four generations of the Thrussell family in the yard; Mary Anne Thrussell Phillips Welsh is standing, wearing a white top, Mr. Fenwick is sitting with Lawerne Phillips on his lap, and Harriett Fenwick Thrussell is standing, wearing a dark shirt and a long necklace. 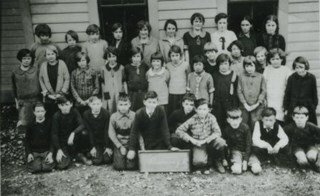 Photograph of a Riverway East School class sitting and standing outside, in two rows, with their teacher standing behind them. Edith and Eva Thrussell are seated in the front row, sixth and seventh from the right, wearing matching dresses with large white collars. 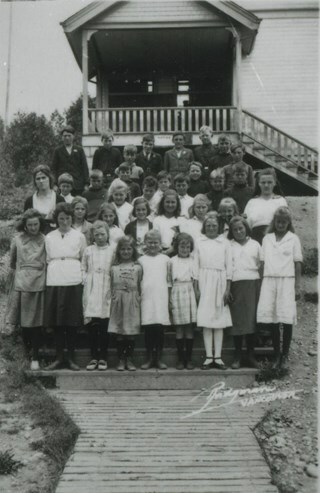 Photograph of a Riverway East School class standing in rows on the front steps of their school. Their teacher is standing on the ground at the bottom of the stairs. 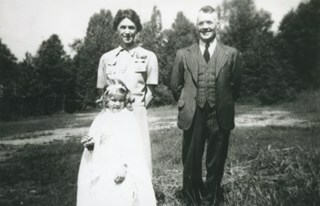 Photograph of Riverway East School staff; Miss Walton (teacher) and H.J. Feakes (principal), with student Betty Hillman ready for May Day. 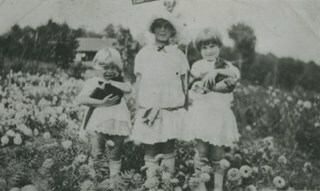 Photograph of three of the daughters of William "Bill" and Lavinia Bearn in their mother's flower garden. Mrs. Bearn sold the flowers in her flower shop. Two of the girls are holding cats. There were seven daughters: Ruth, Gladys, Doris, Helen, Jean, Audrey, and Shirley. 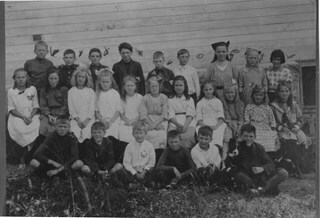 Photograph of students at Riverway East School (later Glenwood School). Photograph of all of the students at Riverway East School. 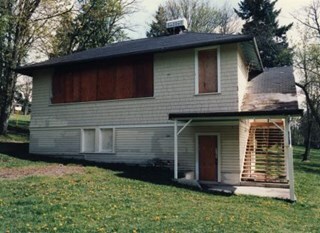 Photograph of the Riverway West School building, in the 4300 block of Marine Drive, just before demolition. Photograph of the Riverway Mission Sunday School bus parked outside of the Riverway Mission. The Sunday School children are all standing out in front of the truck, in the front yard. Photograph of the Harriett and Frederick Thrussell family home on Marine Drive at Nelson Avenue. 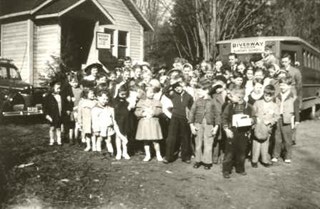 Photograph of the students of Riverway East sitting and standing outside. One group is in three rows on the lawn of the school, while another group is in the background just in front of the school. 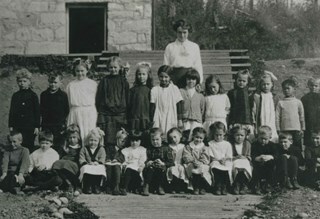 Photograph of a Riverway East School class sitting and standing outside on the grass. Photograph is an aerial view looking south over the Chinese Market Gardens along Marine Drive. The farm on the south side of Marine Drive, second from the east, is 4930 Marine Drive. 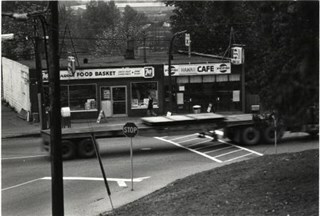 Photograph shows a large truck going past the Marine Food Basket at 5886 Marine Drive and the Hawaii Cafe next door. The buildings were constructed around 1930. Photograph shows a view from Gilley Avenue of the Glenwood Service Station at 5894 Marine Drive. 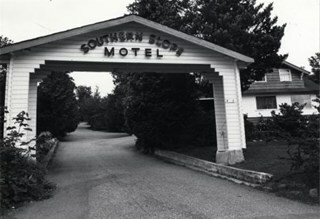 Photograph shows arch at entrance to Southern Slope Motel located at 4653 Marine Drive. 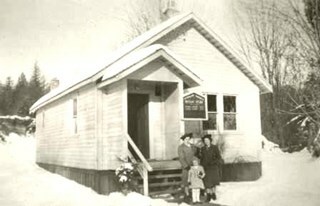 Photograph of Riverway East school, Entrance class. 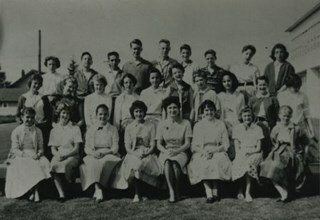 Identified are (front, 2nd from left) Ella Hardie who was later a teacher at Burnaby North High School; (2nd row, far left) Sabra Hardie. Ella and Sabra were daughters of Archie Hardie and his wife, Marie Hardie. 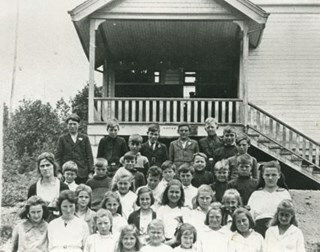 Photograph of a boys and girls class at Riverway West School, standing and sitting outside in three rows. A border collie puppy is sitting on a boy's lap, in the first row, on the far right. 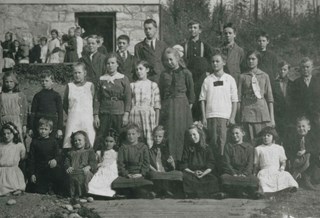 Photograph of an older class from Riverway West School lined up in three rows; the first row of girls are seated in chairs.